Who were the most overrated players in fantasy football for the 2018-2019 NFL season? Fantasy football is an imperfect science, and while our goal is always to provide you with the best, most accurate analysis backed by data-driven thinking, we can’t always be right. Why we should have seen this coming: Wentz had an extremely high TD rate of 7.5% in 2017 and was bound for regression. Why we should have seen this coming: The Patriots offense lost Brandin Cooks, Danny Amendola, and Dion Lewis, and Julian Edelman was suspended for the first four games. The team did little to replace those players. 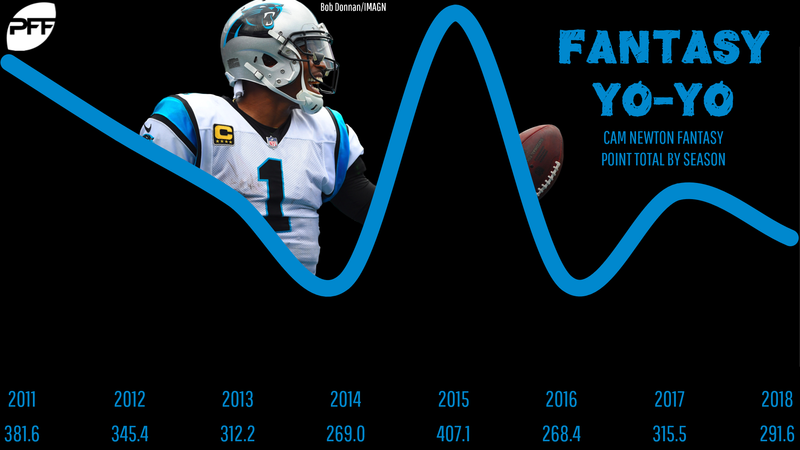 Why we should have seen this coming: Newton was a known yo-yo player leading into 2018, and this season, he was “due’ for a downswing. Why we should have seen this coming: A new head coach and no notable improvement in production from 2012-2017, his age-30 2018 season was no surprise in hindsight. Why we should have seen this coming: Rodgers, age 35, was returning from injury, had a mindless coaching staff, and lost his best, most reliable weapon in Jordy Nelson. Why we should have seen this coming: Fournette was hardly involved in the passing attack as a rookie and averaged less than 4.0 YPC as a rookie. Oh, and Blake Bortles was still leading the show. Why we should have seen this coming: DJ was returning from injury, the Cardinals were led by a rookie quarterback, the offense had little firepower outside of Johnson, and, most importantly, Bruce Arians was no longer the head coach. 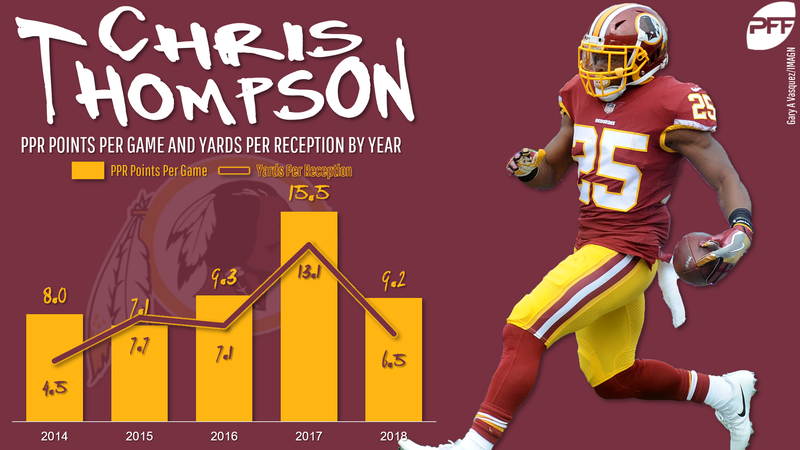 Why we should have seen this coming: From 2013 to 2016, Thompson never averaged more than 7.1 yards per reception. He had 13.1 YPR in 2017 – a clear outlier. He also had just rushing five touchdowns in five seasons leading into 2018. Why we should have seen this coming: The Bills were led by an inaccurate rookie quarterback, it was McCoy’s age-30 season, and he was coming off of a 337-touch year in 2017. Why we should have seen this coming: Freeman was never treated like a lead back in the preseason and the coaches clearly loved Devontae Booker for some reason. Nobody saw Phillip Lindsay coming, though. Why we should have seen this coming: It was Green’s age-30 season, and he had played a full 16-game schedule in just two of his previous four years. Why we should have seen this coming: We knew Gordon was a single mistake from a season-long ban. He also opened the year in Cleveland with Hue Jackson as the coach and a rookie quarterback at the helm. Why we should have seen this coming: Hogan had never caught more than 41 passes in a season in his career. His career-high with New England was 38 receptions in 2016. Why we should have seen this coming: Former first-round pick Parker didn’t break out in Year 2 or Year 3. Thinking it might happen in Year 4 was a doomed idea. Why we should have seen this coming: Cobb had been slowly phased out of Green Bay’s offense after the 2014 season, when he posted 1,287 yards and 12 touchdowns. In the three years after that, he went 829-6, 610-4, and 653-4. There was a lot of preseason excitement about Cobb, but the writing was on the wall. Why we should have seen this coming: We had heard the retirement rumors and it’s no secret that his body has taken a serious number of hits throughout his career. He flashed dominance, but never on a consistent basis. Why we should have seen this coming: This was Olsen’s age-33 season and he was coming off a half-lost year due to a broken foot. 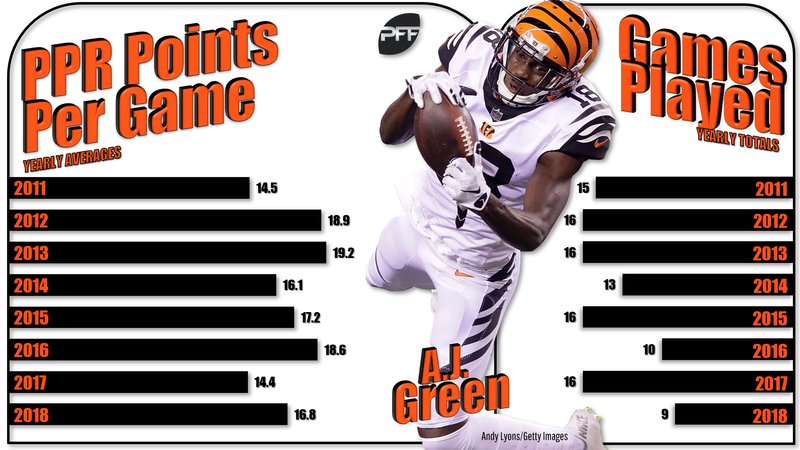 Why we should have seen this coming: Graham was clearly due for touchdown regression after scoring on an absurd 18% of his receptions in 2017. The Rodgers-era Packers had never heavily utilized tight ends before, either. Why we should have seen this coming: Rookie running back Saquon Barkley’s touches had to come from somewhere, as we knew the Giants would force-feed him the ball on the ground and through the air. Engram lost a few games due to injury, which hurt his overall ranking, but he was inconsistent/disappointing even when on the field. 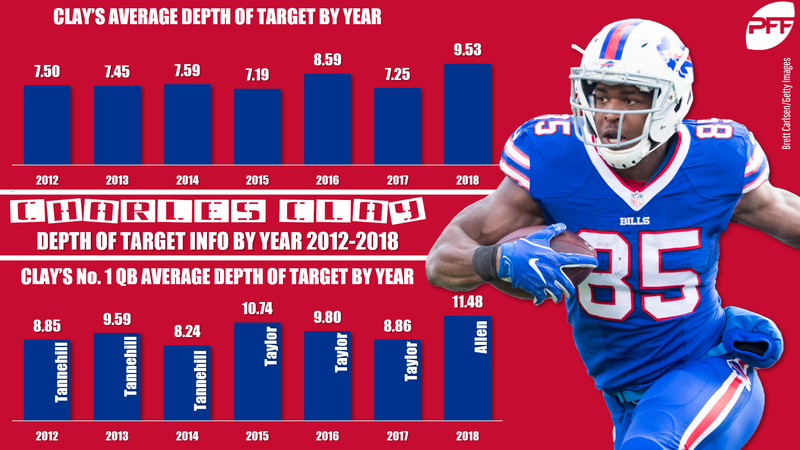 Why we should have seen this coming: Clay had Buffalo’s lowest average depth of target every year from 2015 to 2017, among qualifying tight ends and wideouts. In came strong-armed Josh Allen, who predictably led the league in average depth of target as a rookie.